This year marks the 50th anniversary of CCNFSDU. In the very early days of Codex, in 1965, the fledgling European Coordinating Committee made a proposal to hand responsibility for a new European Committee on Dietetic Foodstuffs to the Federal Republic of Germany due to the experience in this field of the Federal Ministry of Health. The Committee on Dietetic Foods first met in Germany in May 1966. Items on the agenda included matters regarding “gluten free” foods, “foods for nursing mothers, infants and the aged” and even “body building foods”. The Commission subsequently broadened the work of the Committee and the term “dietetic foods” was changed to “foods for special dietary usage” in 1967. With increasing concern globally and in Codex for nutritional aspects of food, it was this committee that again underwent transformation and in 1987 the Commission adopted the proposal for the current title of the committee – CCNFSDU. 30 delegates attended the inaugural meeting of the committee in 1965. Today attendance is well over 300 with up to 60 countries participating along with over 30 observer organisations. The committee currently has 14 texts in the Codex Alimentarius. They deal with issues ranging from diet and weight control, to vitamin and mineral food supplements and gluten free foods. Some of the most debated work of the committee regards the standards on infant formula and, at this 38th session in Hamburg, the review of the standard for follow-up formula. Acknowledging all the views of Codex members, the parent organisations FAO/WHO as well as considerations from industry and consumer associations often means that Codex takes a considerable amount of time to reach agreement in this area. Debate in working groups and in plenary sessions has to consider scientific and technical issues such as essential compositional requirements of the product (proteins, vitamins etc) together with wider matters including the scope of the standard, labelling requirements and even the name that is to be used. The guiding principles for Codex in developing an international food standard are consumer protection and ensuring fair practices in food trade. Codex also needs to consider the global magnitude of an issue and any potential impediments to international trade resulting from divergent national legislation. In addition, Codex has a responsibility to take into account the identified needs of developing countries. these documents have contributed to providing safe and nutritionally adequate foods to infants and children worldwide. There have been eight chairpersons since 1966 and Dr Pia Noble, the first woman to hold the post, has been in the chair since 2010. Shortly before the session Dr Noble spoke about the achievements of the committee since its inception. "Throughout its 50 years the committee has been very active and elaborated a wide range of important standards. Some of the main achievements are the standards and guidelines developed in the area of foods for infants and young children. Based on the newest scientific knowledge available, these documents have contributed to providing safe and nutritionally adequate foods to infants and children worldwide." On the subject of nutrition Dr Noble addded: "As a main achievement, I also consider the committee's work on the nutritional aspects with regards to the Guidelines on Nutrition Labelling. Our work on Nutrient Reference Values for labelling purposes also plays an important role in the prevention of non-comunicable diseases". 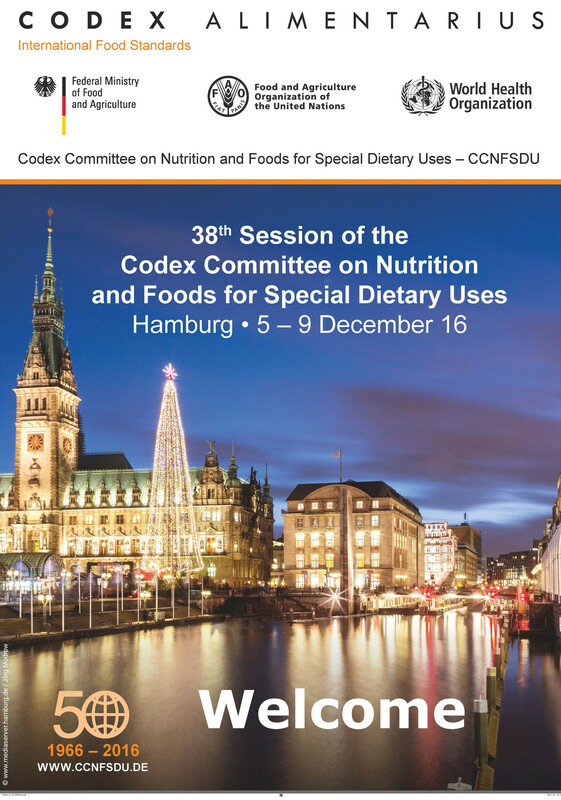 "Codex is also an important platform for discussions on nutritional aspects connected to Codex work not only in the plenary and the working groups but also through personal contacts and networking between experts in this field" she said. There is a full agenda this year and Dr Noble said she expects "a lot of discussions and that we make good progress on our work. The skill and devotion of the chairs of our working groups provide an invaluable contribution in presenitng the Committee with excellent documents on which to base our deliberations." This Codex committee attracts more attention from observer organisations than perhaps any other. "I am very pleased with the level of interest in the work of CCNFSDU from Codex observers representing consumer organisations, industry and academia. I appreciate their valuable contributions to the committee and its working groups. This underlines the importance and the worldwide recognition for the committee's work" said Dr Noble. Codex is mindful of both current and emerging issues regarding food safety. "I expect we will continue to revise existing standards, aligning them to new scientific findings and when we are needed to elaborate new standards or guidelines for specific categories of foods for special dietary uses, the committee will be ready."